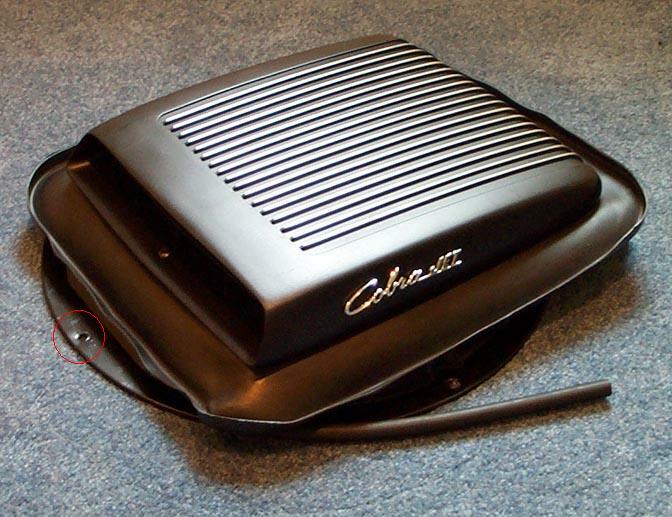 This page describes the R-code (ram air) air cleaner scoop used during the 1969 and 1970 model years. I'm not aware of any differences in the scoop assembly between the two model years. Interestingly, I don't see a service part number for the midplate in the Master Parts Catalog. It's illustrated as being part of the 9D612 vacuum motor assembly and the 9600 air cleaner assembly. 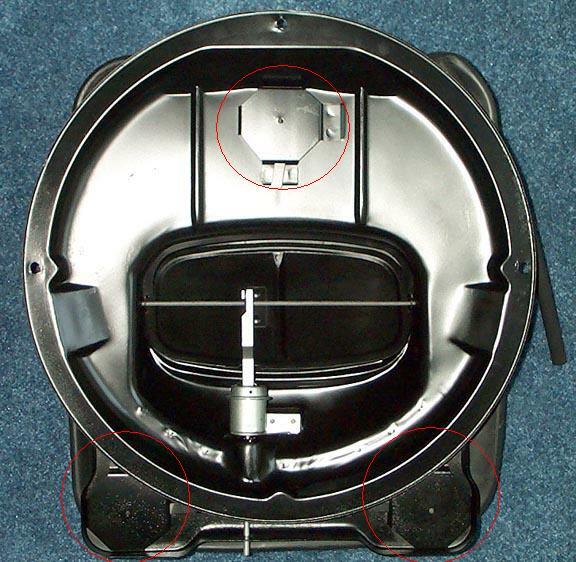 Notice the mounting hole circled in red in the picture above. The 428 CJ midplate has only one hole here. The midplate used on 351 engines has two holes here to allow some adjustment for 2v and 4v carburetors. Seals: Reproduction seals are available from many vendors. I've been told that the material used is a bit thinner than the Ford originals. The MPC lists the dimensions as 17.75" long, 13" wide, and 1.14" tall. The same seal was used on 351, 390, and 428 engines equipped with a shaker scoop. I've also seen NOS service seals that don't have an engineering number on them. Is this a change over time, or a matter of different suppliers? Mounting Bracket: The 1975 Master Parts Catalog lists the same bracket for use as a service part on 1969 390 Mustangs, 1970 Boss 302 Mustangs, and 428 CJ Mustangs equipped with a shaker scoop, but apparently the factory-original part used on the Boss isn't the same part that was used on 428 CJs. I'm not sure which bracket Ford used as the later service part. Correct reproductions exist for both the Boss and CJ applications. Scoop Assembly: The ribs on the top of the scoop are painted silver. Minor fitting adjustments can be made using the three adjusters noted in the image below. The normal position of the flapper is open because there's no vacuum applied to the motor. The flapper closes when normal engine vacuum is applied, and it opens when vacuum is lowered under hard acceleration. OK, so what about the "428" emblem that's sometimes found on the scoop in addition to the "Cobra Jet" emblem? This same emblem was used on the non-functional, fixed hood scoop found on Q-code Mach 1s. My best guess is that it was sometimes used in early 1969 production, and was eventually dropped in favor of using the "Cobra Jet" emblem alone. This could have been a cost-cutting measure, or perhaps some Ford executive decided that the scoop looked better without both emblems. I'm open to other ideas.